After teaching grades 7 and 8 for seven years, it was a challenge for me to go down to Kindergarten. The first few months, the way was treacherous. Now looking back, after eight months or so, I can say overall it has been a delight, and I know it was a gift I didn’t even know I needed. I find I can practice what I learned in my Master’s program; that is, teaching young children literacy. Most importantly, though, the children are “wonderful, marvelous, beautiful, magical, filled with curiosity and dreams.” (Lyrics by Debbie Clement) They are loving and open. They are learning sponges with big, growing brains. But how can I do genius hour with them? I wondered. I loved the engaged ownership in junior highers when they were given a chance to learn what they wanted in what we call genius hour. I believed in making, but I didn’t know much about Kindergarten. 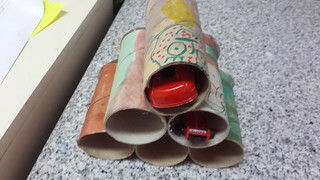 I had learned to trust Faige, though, so when I saw her tweet last March, I began to run with her ideas in Kindergarten. I began collecting supplies and asking families to do so, as well. We have quite a collection, and we go through a lot of materials. When I learn something new about brain research, I share it with my Kindergarteners too. They are not too young, and even though I’m speaking a foreign language to them (they are native Arabic speakers), they understand enough. They know they are capable and creative, and as they create, they get smarter. And they know that as they learn two languages, they get bigger brains too! So, we are definitely still making our way (pun intended), but we’ve had some huge successes. 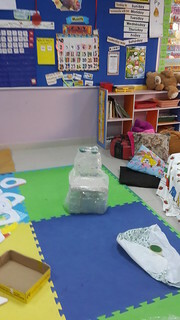 After we made a small couch for our reading center as a group project, one boy took on the task of making a very small chair with the ten juice bottles we had recently accumulated. He needed lots of help, but that’s where I came in handy, helping to wrestle the juice bottles and operate the hot glue gun and packaging tape. He was the maker. I was the sous maker taking my orders from him. The little chair finished and ready for a cover. Genius hour in Kindergarten. It’s happening. We are calling it that, we are making and learning, but I am always open to suggestions you might have for helping us do it better! Please leave a link in the comments to your primary genius hour projects and process. Or share on Twitter with the hashtag #PrimaryGH. Hi, I am Ashley a student in EDM310 at the University of South Alabama. I enjoyed reading this post. I definitely have taken notes for my future classroom. 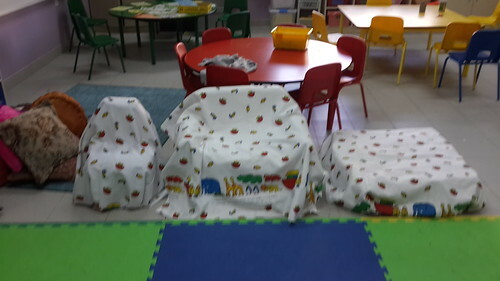 I like how the little boy decided on his own to make a chair after the class as a whole made the couch. Very helpful post for me being a future teacher! Thanks, Ashley, for coming by again to visit! I love EDM310 students from University of South Alabama. I’ve met quite a few over the years. I haven’t seen your blog yet. Would you share it with me? I hope you do take lots of notes about Genius Hour! It’s been an amazing transformation of my teaching. I see it every day in the way I interact with my students, the choices I give, the higher expectations I have for them to take initiative and solve problems, and more…It’s been quite amazing. Best wishes to you in your education classes. Give my regards to Dr. Strange, please. Oh what fun to be in your maker Genius Hour Kindergarten! Look at all the solutions created through imagination and supplies! They are marvelous thinkers and doers and solvers! Hi Denise, my name is Heather Trawick and I am a Elementary Major at the University of South Alabama. I came across your blog post, and I really enjoyed reading about the concept of a ” genius hour”. 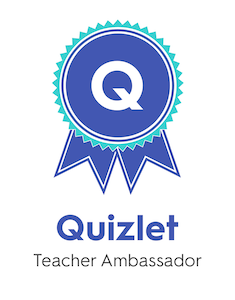 I think this was a neat idea and I would love to use this in my future classroom. It is a great way for keeping the kids engaged and it also lets them have a sense of character in their creation. It is awesome to see what their little brains can come up with. I’m a student at the University of South Alabama as well, I absolutely enjoyed reading your thoughts and insights as an educator in the classroom, I think it’s so great that you’ve encouraged these young children to expanded their imaginations and let them become mini inventors. I’ve recently started blogging as a requirement for one of my courses, EDM 310, I will definitely continue blogging as a student teacher and then as a teacher and I’ll save your site so I can spark ideas. http://spiccianijustineedm310.blogspot.com/ This is my blog for my EDM310 class if you’d like to view it. Blessings to you as you grow as a writer and teacher.